OMG WE HAD OUR FIRST COLD FRONT! 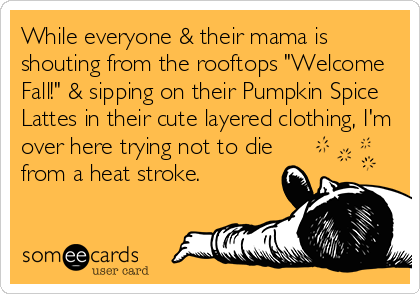 Laugh all you want, but this is the highlight of the year for us Floridians who run the risk of heat stroke through most of Fall. We don’t wear flip flops in the Fall solely to make Northerners cringe, it’s out of sheer necessity people! Wearing them in Winter is an entirely different story… don’t judge my hoodie and flops! Now that there’s officially a chill in the air, the soup kick that I’ve been on since August is exponentially more acceptable. To celebrate the need to crank the heat and bring my basil indoors, I made soup. Potato soup! And since my fresh basil was snuggled up next to the stove, I decided to let it in on the fun. Just looking at that bowl-o-deliciousness makes me want to grab a spoon and dive in! Let your slow cooker or Instant Pot do all the work! This super simple soup is a set it and forget it type of deal and can be whipped up with minimal effort. Some quick peeling and chopping and you’re on your way to a delicious bowl of soup with leftovers that taste even better the next day! 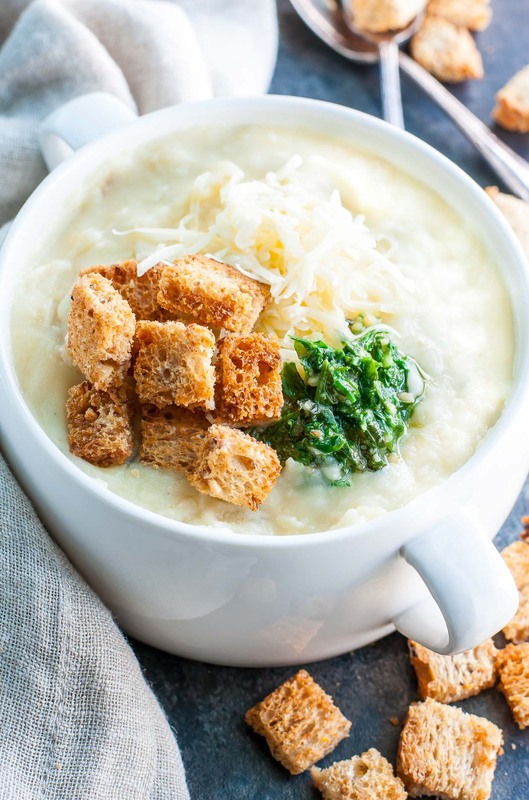 Creamy potato soup is the ultimate comfort food! 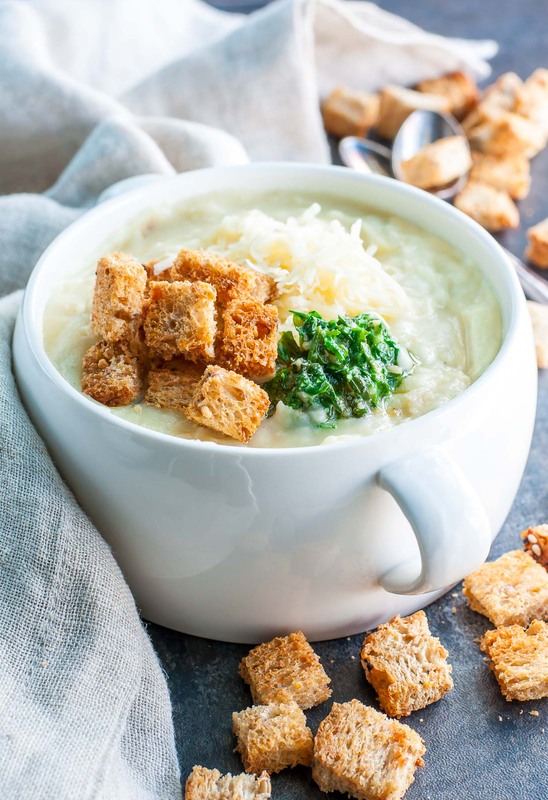 This Cheesy Pesto Potato Soup is a lighter twist on the classic with all the bowl-licking flavor of the original! TASTY TOPPINGS :: Choose your favorites! Scrub and peel your potatoes and roughly chop. Chop your onion and celery and toss all your veggies in the pot! Set your slow cooker to HIGH and cook for 4-5 hours, or, if you're gone for the day, set it to LOW for 8 hours. Ready to eat? Simply mix in your milk, cheese, and green onions. Pile on your choice of toppings from the list above, including lots of tasty pesto, and dig in! Chop your onion and celery and toss all your veggies in the pot along with the veggie broth. Adjust valve to seal, lock lid, and set Instant Pot to 10 minutes. Once finished, quick release the pressure by carefully switching the valve to vent. For a silky smooth soup, an immersion blender to blend fully, or leave it a bit chunky by only blending about 2/3 of the soup. You can also use a potato masher for an extra thick and chunky soup - anything goes! Next add garlic, butter, salt, pepper, milk, cheese, and green onions. Swirl in 2-3 TBSP of pesto, to taste, and top soup with all your favorite toppings from the list above. Enjoy! FOR THE CROUTONS: pre-heat oven or toaster oven to 350 degrees F. Chop bread into small cubes, drizzle with melted butter or olive oil and toss to coat. Top with paprika, garlic powder and salt, to taste. Toast until golden brown. Need a pesto recipe? No problem! My go-to trick for pesto that stays vibrant green (even when frozen) is blanching before blending! Toss your basil leaves in boiling water to blanch briefly. Once they turn bright green, remove leaves with a slotted spoon and add to a bowl of ice water to halt the cooking process. Pat the leaves dry with a paper towel then follow the steps below. This is optional but my absolute favorite technique and well worth the effort for gorgeous green pesto! Combine basil, walnuts, and garlic in a small food processor. While it runs, slowly pour in your olive oil. Add your parm cheese and puree for about a minute or so more. 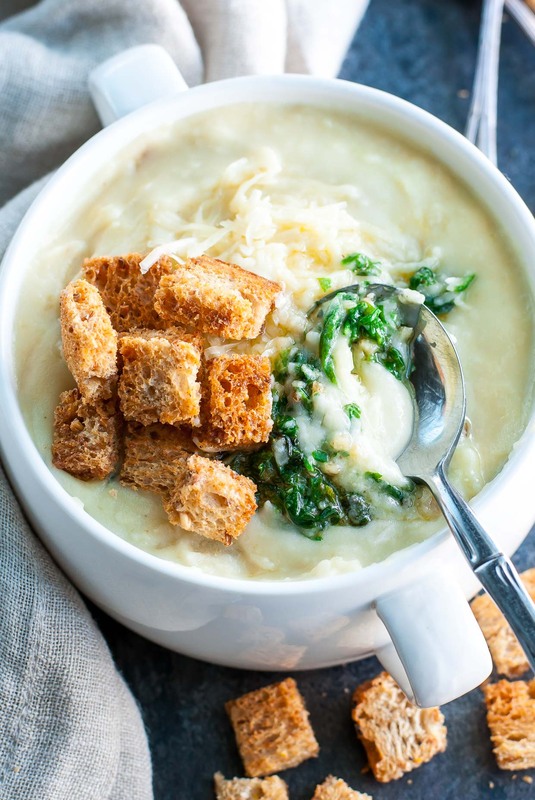 Swirl into this soup or serve over pasta, pizza, or anything your heart desires! You can also use an immersion blender to make the pesto, score! This pesto tastes great with the cheesy pesto potato soup recipe above, and goes great with everything from pasta to pizza! There are a million and one ways to make this gorgeous green sauce and even more uses for it! 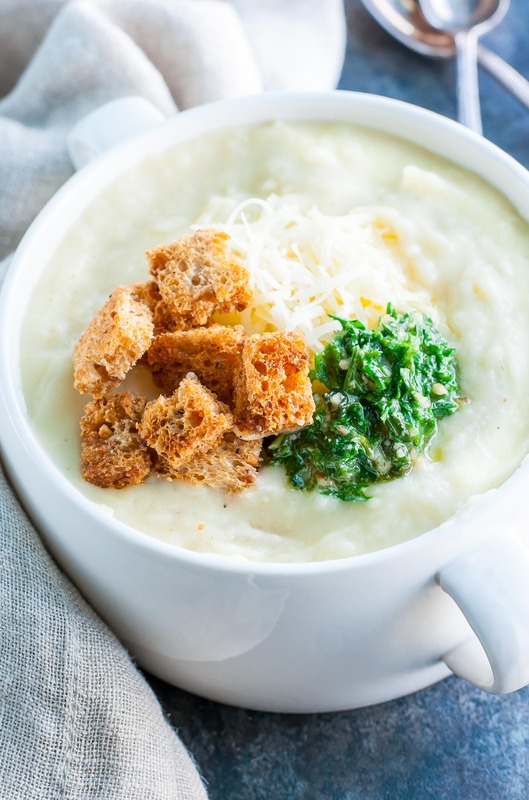 For this slow cooker potato soup with pesto, feel free to use your family’s favorite method, a sassy store-bought sauce, or try something new and adventurous with my Roasted Garlic Kale Pesto or Pistachio Arugula Pea Pesto! Ugh, put more of this in my face, NOW! Delicious, quick and easy, and super fulfilling. Thanks so much for the tip on making the pesto stay green. I never thought of blanching the leaves first, but it makes perfect sense! I often make a batch and freeze part of it in the fall when the garden is winding down and always disliked how brown looking it is when I pull it out of the freezer. Sure it tastes OK, but not as eye appealing as fresh. 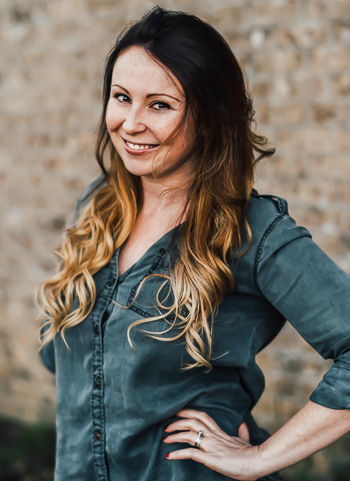 This technique is awesome – can’t wait to try it! 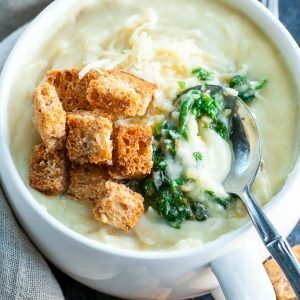 Now that is one delicious bowl of comfort food and that pesto and garlicky croutons take this dish over the top. Totally know how you feel about the cold…I swear my blood has gone thin living in Hong Kong. Shring, of course! Potato soup, you had me at potatoes. Love potatoes, and I’m sure I will love this soup. I always keep a jar of pesto in the fridge for making quick and easy meals and adding some to this soup sounds just right to me. Cold fronts are fun, we just had one come through Texas and I’m so happy. I’m ready to start wearing my winter clothing, it’s almost December.